Who needs a college football championship game when you have the amazingly bad Demons 2? 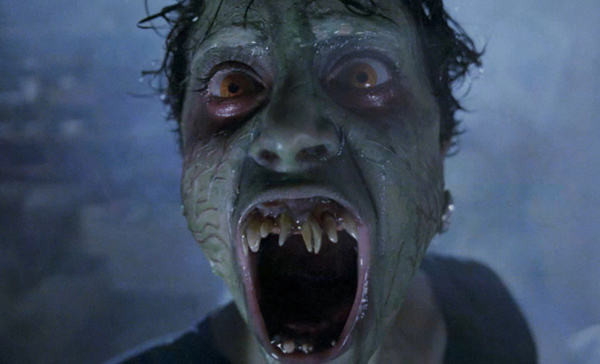 Yes, last night I revisited the sequel to one of my all-time favorite horror movies ever, 1985’s Demons. Oh sure, Demons is not Academy Award level cinema by any means – but it’s fun, gory as hell, and has a great soundtrack. And it has Bobby Rhodes. I hadn’t watched Demons 2 in a long time, so imagine my pleasant surprise that I was inspired enough the morning after to write this post. Oh lord. Now you know you can’t help but laugh when that prop head of Sally pops up. This sequel pretty much tries to follow Demons beat for beat, as Sally’s transformation (especially the teeth part) mimics Carmen’s from the original almost to a tee. The effects are definitely cheaper this time around, but it works because the movie itself is, well…..cheap. God bless the 80’s though, because it was acceptable to be and look cheap back then, especially in horror movies. Therein lies the charm, my friends. And Demons 2 is full of it. Charm that is.